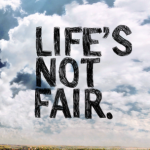 topsuccesssite » Life Is Not Fair, Just Get Over It! 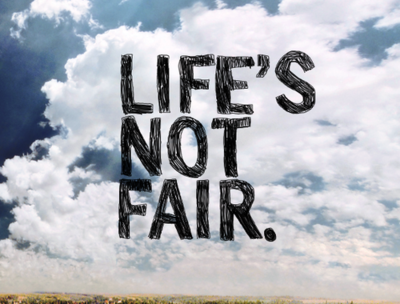 Life Is Not Fair, Just Get Over It! Hey here is a news flash. Life is not fair. I will say this again, life is not fair! Ok so there are two types of people in this world. Those who know life is not fair and choose to move on, make their own way, and hold themselves accountable for their success in this world. Then there is a second group of people who know life is not fair, and they have chosen to blame every short coming, miss-step, all their bad luck, and all other things that have gone wrong in their world on the fact that life is not fair. These people use phrases like woulda, shoulda, coulda, and if only. They consider themselves victims. Life has given them the short stick. Life has been unfair to them. Life has not been kind to them, and they have every right to blame someone else for where they are not. I was once watching a television show and my wife was watching with me. The show had a young women who was having problems getting a handle on her life she had explained how she has grown up with an alcoholic parent, and it caused all of her problems. As I watched I said to my wife “I feel sorry for her and what she had to go through growing up”. My wife looked at me and said “Jeff, you went through the same thing, and I have never heard you once ever reference that as a reason for you not achieving success or from keeping you from achieving your dreams”. I had not even thought about it. It had never even dawned on me to use the thought of my somewhat troubled childhood as an excuse as to why I might not get what I want out of this world. If anything I used it to motivate me to do better and be better. It motivated me to take control of my life and always have options based on my abilities and my work ethic. I am certainly not questioning the young women’s pain, but we all have to work through our past. Working through our past and our pain is part of what life is about. Truly successful people do not feel entitled to anything in this world. They find a way to They know that you have to earn everything you get, and that the world does not dictate how far you go and the dreams you achieve, only you do. I will say that again, ONLY YOU DO! I am not here to talk down to anyone, but I have to tell you that if you are one of those people who feel the world, the country, other people owe you something, you are going to have a long road to success. You have to be willing to accept full responsibility for what you do, and what you make of your life. There are no do over’s. There is no tomorrow! You control your destiny. You can either allow life to beat you down or you can choose to bask in the great things this life has to offer. Whichever you decide to do know this, the choice is truly yours. We decide the road we choose to take, and the attitude that we decide to take towards life. Write this down on a piece of paper (I am solely responsible for my life and my dreams. The world owes me nothing. I must do it on my own). Carry this with you and read it at least 20 times a day. When you feel yourself wanting to blame someone else for your situation read the paper out loud, pick yourself up and keep moving forward. Adapt this millionaire mantra and know that the truly successful people and wealthy people in this world know it all falls on them to make their dreams come true. The do not feel the world owes them anything. They work for what they want.